Sing is a new way for communities to get behind us and raise funds for Samaritans. Our listening volunteers work round the clock to be there when it matters – and we're calling on choirs, singing groups, workplaces and schools to sing anytime, night or day, to help us continue to be there. Do what you do best and sing to raise vital funds for Samaritans. Why not support us at your next event, or put on a special performance? Make a positive difference with your work mates. Get involved and organise a lunchtime singing performance - and raise money for Samaritans. Singing can do wonders for young people’s health & wellbeing so we’re calling on all schools to raise their voices for Samaritans. It’s the most fun way to raise money and make difference! Sing encourages young people to sing together, loud and proud, in support of Samaritans. Sign up your choir, school or workplace today and Sing for Samaritans! 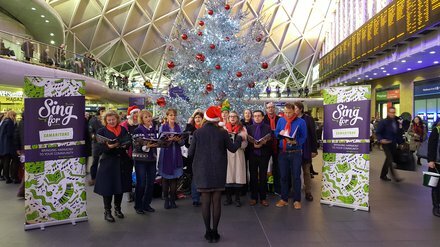 As part of Sing for Samaritans, we’ve performed at London stations and even sung under the Christmas Tree at Trafalgar Square. We all love singing but knowing that we’re raising money to make a difference, keeps us all coming back for more.